Custom & Stock Engraved Signs at Guaranteed Best Prices! 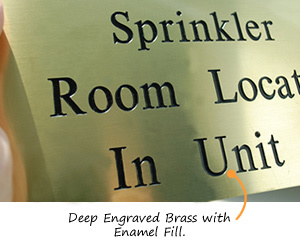 Our strategy is straightforward – make it easy to order engraved signs. With an array of online features, ranging from our instant quotes to our award-winning web design service, you can see why thousands of customers order their plastic signs and engraved signs from us. There are no hidden charges for extra lines of text. 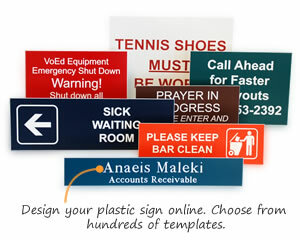 Click here to learn why we are the web's leading online engraved sign provider. • Deep Engraved Brass Signs. These lustrous signs with a rich black image is great for the military, downtown offices or awards. 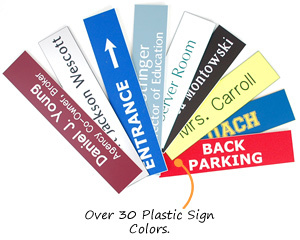 • Outdoor Plastic Signs. They give you years of outdoor durability. • Architectural Engraved Signs. These distinctive designs are available in 16 different designer colors. • Start with a size. Wizard makes it easy to design any sign. • Durable for outdoor use, and still elegant for inside your office. • Architectural-quality, in any color. In stock and ready to ship. • Tent-style, laser engraved. Available in 16 colors. • One-of-a-kind plates with adhesive or screws. • See from either direction. Place above door in hallway. • Spot signs at night or in a blackout. Signs glow brilliantly. • Honor a loved one with a hand crafted plaque. Brass or plastic. • Personalize over 90 designs for an unforgettable presentation. • Circular or square tags are engraved on 1 or both sides. 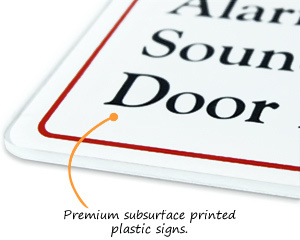 • Designer signs feature embedded engraving under thick acrylic. • Stylish rosewood engraved, or high-tech full color nameplates. • Occupied or vacant, use a slider sign to let everyone know. • Over 2,000 Stock & Custom Door legends. Contour designs. • Over 50 legends and 18 different colors.